Although there are several Samsung smart phones that are in demand among the brand loyalists, the Samsung Galaxy A7 2017 is one of the devices that you must certainly take interest in. This is not only an amazing phone, but has also been priced at a range that is pretty much affordable. And since A7 is one of the old launched mobiles from the brand, you might believe there would not be much different in the 2017 edition, as compared to the 2016 edition; you could not be more wrong! There is a lot in Samsung Galaxy A7 mobile 2017 that has been changed, a lot of the device’s features have been revamped, and the key specifications have only been improved. However, this also has a few setbacks, like no fingerprint scanner in the 2017 edition, unlike the 2016 one. But this has been compensated for by a bigger screen size, as well as improved camera quality. Read on to know more about the device. Price – The 2016 edition of Samsung A7 was priced around Rs 25, 000 Samsung Galaxy A7 2017 on the other hand is priced around Rs 33, 000. 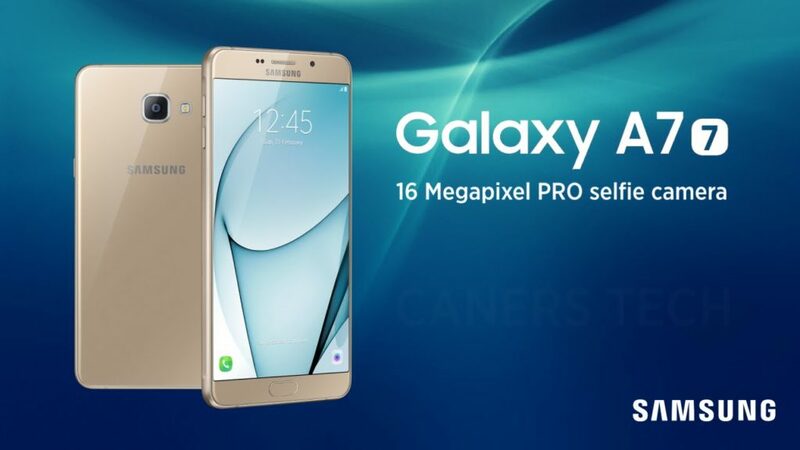 The price of the device has not only been increased because it is a more recent launch, but also because it provides a lot more than what was provided in the 2016 edition of Samsung A7. One of the greatest drawbacks of this device is that it continues to operate on Android Marshmallow. Even though it got launched in January this year, and Android 7.0 was launched somewhere in 2016, having one of the latest mobiles, not supporting the latest software, sure is a turn off. Features – This is one of those areas where your interest in Samsung Galaxy A7 2017will be restored. Apart from making a shift in the erstwhile 5.2 inch screen, to a 5.7 inch screen in this one, they have also improved its quality. A7 2017 has an AMOLED 5.7 inch screen, with a screen resolution of 1080 X 1920 pixels. The battery life of the device has also been improved, as it now comes with a 3600 mAh battery. The company promises a talk time of 23 hours with this battery, without using internet. Samsung Galaxy A7 2017provides you with a feature of ‘Always on screen’ this allows you to have all time access to your clock and calendar, so even when you are sleeping, and suddenly need to have a look on the time and date, you do not have to unlock the phone. This is one of the handy features you could make use of. Specifications – There has been a most certain improvement in the key specifications of Samsung Galaxy A7 2017. One of the most noticeable improvements is in the camera of the device. A7 2017 has a 16 MP camera on the front as well as on the rear. Both the cameras have auto focus, and the rear camera has an LED flash as well. The camera on both sides has been designed in a way that it is perfectly fit for clicking pictures in dim light. Along with an amazing camera, you are also provided with a 15 GB cloud storage space, for storing personal data. Samsung Galaxy A7 2017 has a 1.9 GHz processor, along with a 3 GB RAM and 32 GB internal storage, which can be extended up to 256 GB with an external SD card. The device has support for dual nano sim cards, in addition to an external SD card. This provides support for not only additional storage in your device but also for additional connectivity. Verdict – Out of the multiple phones that have already been launched in the year 2017, this is certainly one of the best. It not only comes from a trusted and most preferred brand, but also provides you with quality features at a range that is not very high, and is fairly affordable. However what continues to remain true is that there is nothing surprisingly new this device has to offer. What it offers is something that can be availed in multiple other devices as well. In addition to this, it runs on Android marshmallow and not on Android Nougat.